Destination :Bora Bora, French Polynesia. My fiancé had wanted to holiday in Bora Bora since before we were even engaged. I think it had a lot to do with the fact it was so hard to get to, the remoteness and the knowledge if we were ever going to holiday in Bora Bora, this was the opportunity. To be honest we debated over whether our honeymoon should be somewhere unique like Iceland or Norway, somewhere modern like Japan or the more iconic honeymoon beach getaway. The beach won! Of course we had seen the images of the over-water bungalows and the perfect blue water in magazines and online. We really wanted that exclusive, unforgettable, irreplaceable honeymoon. We looked at a lot of the popular island beach escapes and it was through the world of Instagram that we became more familiar with Bora Bora. Specifically, The Four Seasons Bora Bora was featured in Conde Nast Middle East - from there our minds were made. 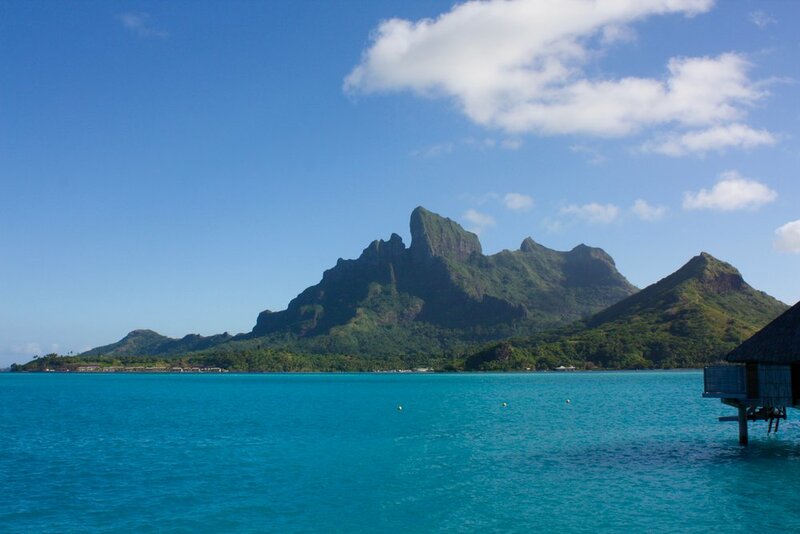 Ironically, one of the attractions of Bora Bora for us was its remoteness. In fact, from our home in Dubai it is probably as far away as we could go. There are a few ways to get to Bora Bora, but all will involve an international flight into Vaitape, Tahiti. The airport receives flights from Auckland, Los Angeles and Honolulu. We flew with Emirates from Dubai to Auckland, via Melbourne - although there is now a direct Dubai to Auckland flight. We had a 2 day stop-over in Auckland on the way there, which was enough to experience the city. In Vaitape, we stayed the night at a cheap airport hotel due to connections times. It did help to adjust with time zones to get some sleep before heading to Bora Bora. The small domestic flight into Bora Bora offers your first opportunity to experience the magnificence. There is no allocated seating so try and board early and get a seat on the left of the plane (facing the cockpit) for your inbound flight. On this side you will get the best view of the island on your descent - the volcano remnant that is Mount Otemanu on the main island, the magnetic blue lagoon, the surrounding sand atol and the deep blue Pacific Ocean...........its an unforgettable image. Arriving at Motu Mute airport, we were greeted by staff from The Four Seasons Resort. 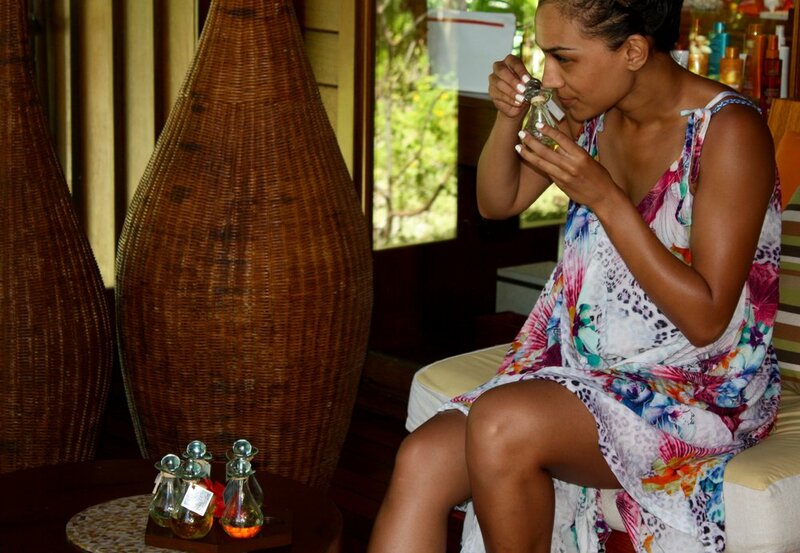 From the moment you arrive, the Polynesian culture is captivating - friendly, happy, welcoming and accommodating. There is a short boat ride from the airport to the resort, with each property providing its own shuttle service. Many people are surprised to find out that Bora Bora is actually part of the French Republic. There are a total of 118 islands and atols spread over quite a large area of the Pacific Ocean that make up French Polynesia. Bora Bora is part of the Society Islands along with Tahiti. French Polynesia is still under French control and inhabitants have French passports. The majority of inhabitants speak French and there is a mix between native Polynesian and French migrants living on Bora Bora and the other Polynesian islands. The islands, including Bora Bora, have a very interesting history of colonisation and interaction with countries that are geographically very remote. In addition to the French influence, Bora Bora became particularly prominent for the United States during World War II, when it became an important supply base in the Pacific. The Americans developed a lot of infrastructure during this time including the current airport, which at the time it was built was the only international airport in French Polynesia. Several of the cannons that guarded the island during the war are still features of the islands landscape. Bora Bora is unique in that it is made up of a central island and surrounding atol (sand islands) - this creates the uniquely protected lagoon that surround the main island. Most of the iconic 5-star resorts are on the surrounding atol and are very independent of each other. A huge appeal of these resorts is that your are quite secluded. The seclusion does restrict your access to shops and services. Whilst the resorts essentially cater for everything you need and can arrange for things to be brought to you, it is better to plan ahead. The main island does have a small, but well stocked grocery store, lots of pearl shops, some restaurants/cafes and other small stores. To get to the island you will need to take a shuttle boat, which isn't a free service! I would recommend bringing anything you think you might need with you! Always an interesting travel question is the accepted/expected culture around tipping. In French Polynesia it isn't customary to tip staff, which some people find unusual. I think it is a case of each to their own, but it certainly isn't expected or mandatory like it is in some parts of the world. Whilst both French and a dialect of Polynesian are spoken on Bora Bora, we found nearly everyone did speak see English. Its always nice to learn some of the local greetings and this is even more so in Bora Bora, where the local people are so friendly and always greet you with a smile and the customary "Ia Ora Ana"! French Polynesia is famous for pearls and it almost seems like there are more pearl shops in the main street on Bora Bora than there are residents. There is a vast range of sizes, quality and prices in the different shops and it can certainly appear quite confusing. We wanted something special to remember the honeymoon and looked around for some time in the different shops. One of the shops stood out in terms of their service and value for money. I would have no hesitation recommending Albert Store Bora Bora. They were extremely patient, gave unbiased advice and their service was excellent. It is a family owned store and they are happy to talk you through the entire process from pearl cultivation to showing you how they select and design strings of pearls. If you are looking for a special momento, definitely visit this store! If you are travelling to Bora Bora, then this is the time to save and splurge the extra to stay in an over water bungalow. French Polynesia was where this concept originated and they have come to perfect the iconic accomodation! 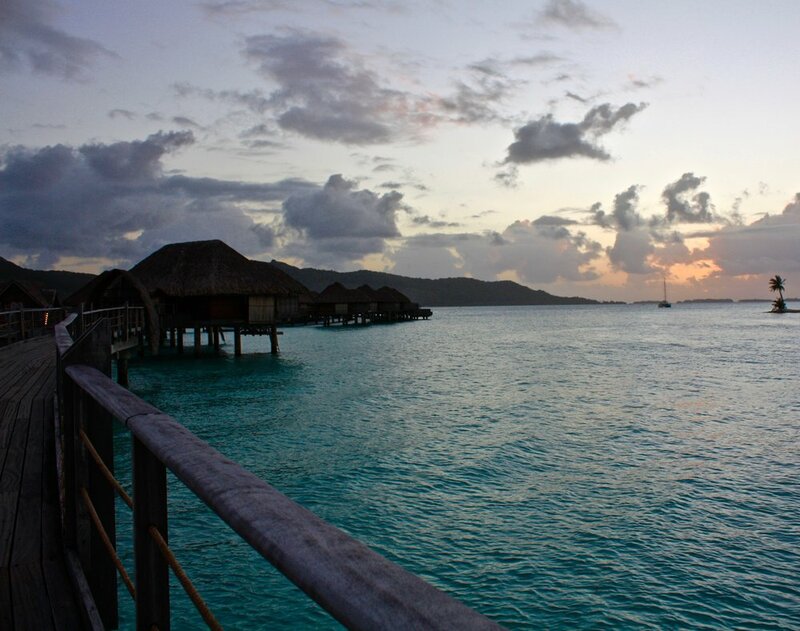 When we decided on Bora Bora as our honeymoon destination, we allowed the visual world of instagrm to help narrow our search of where to stay - it was almost impossible to go past The Four Seasons Resort! The resort staff were amazing, they genuinely are passionate about trying to make sure every guest enjoys their stay to the fullest. We did find that the resort catered mainly for couples - honeymoon, anniversary, retirees and also to families. It probably isn't the ideal destination for groups of young travellers and the nightlife is relatively quiet. We found this perfect for a honeymooning couple, but did agree that teenagers or groups of young travellers might not enjoy the very relaxed atmosphere. It isn't a cheap option by any stretch and it might be hard to justify aside from a special occasion. That said, I think if you are going to spoil yourselves, you definitely want to feel like it was worth the expense and this you will get at Four Seasons, Bora Bora. There are a large number of activities complimentary at the resort and many others that the concierge will arrange. We didn't feel there was very much at all we needed to do that was outside of what the resort offered or sourced. The Resort itself has a large private lagoon where guests can kayak around, lay by the water or explore with snorkel and mask. It is a really safe place to learn how to snorkel or get your confidence, children can even float on "pool-noodles" while learning how to snorkel. 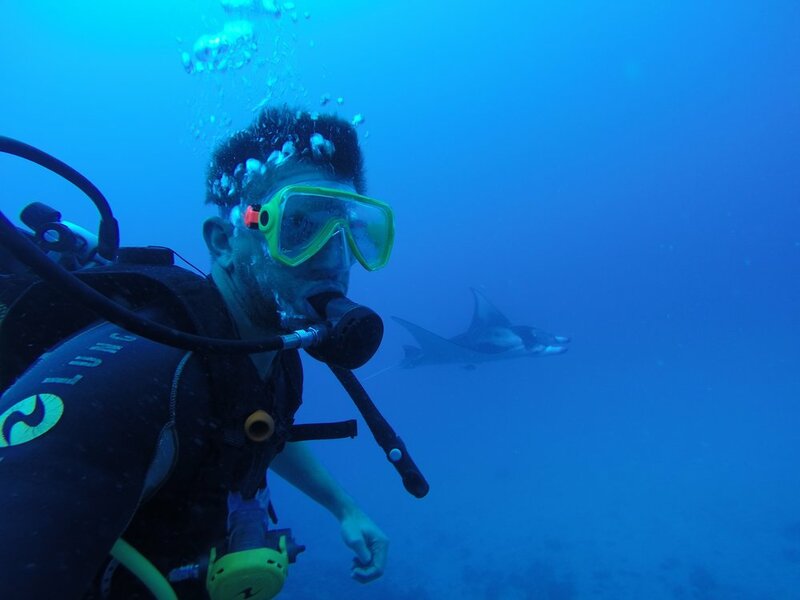 The resort has a resident marine biologist, Dr Oliver Martin, who has cultivated coral gardens and small reef structures and successfully developed an entire ecosystem. From the smallest invertebrates, myriads of colourful fish, right through to moray eels hiding in small caves, the lagoon is a great place to explore. Oliver also runs educational tours where guests can learn more about the delicate coral reefs and how we can help to preserve them for future generations. Four Seasons has an excellent fitness and wellness centre. The gym is very well equipped with weights and cardio equipment. It opens onto the ocean side of the resort and its uniquely relaxing to sit on an exercise bike watching the waves of the Pacific Ocean pound into the reef. The wellness centre is absolutely perfectly set up for couples spa treatments - with a wide range of options for massage and relaxation. There are several baths of different temperatures to soak in. The therapists are experienced and a relaxing massage in this perfect setting is a wonderful way to really unwind. Four Seasons has a large number of activities at the resort that you can get involved in. We tried out some of the water sports - kayaking and the water bike which are fun ways to explore. There is also volleyball, badminton, tennis, yoga and jet skiing. It is truly hard to explain the difficulty in balancing the want to try everything, yet also take advantage of one of the most relaxing places to simply lounge by the water. The list of possible activities that are provided by Four Seasons is impressive. Probably the only difficult decision we had for our honeymoon was deciding how we were going to try and fit everything in, especially when its so tempting just to spend hours lounging on the private deck or by the pool. 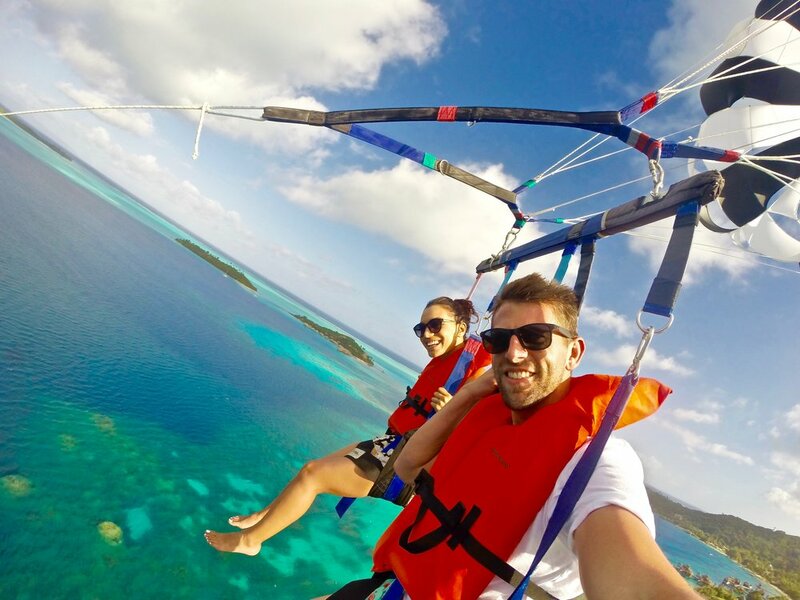 One of the best features of Four Seasons Resort was they gave fantastic advice both before we arrived and after arrival in terms of what activities they thought we would enjoy. The bookings team and then the concierge are great at co-ordinating all your activities and you receive an itinerary each evening listing what you are doing the next day, where you need to be and what you need to take! Like i said, deciding what to do is your only stress! Scuba Diving: Getting our SCUBA accreditation was one of the best things we have done - it literally opens up experiences into worlds that simply have to be seen. As soon as we decided on travelling to Bora Bora, we talked about the chance to dive with manta rays. In the days leading up to our dive, we were lucky enough to see the incredible rays from the air whilst parasailing and from the boat, as one leapt from the water. 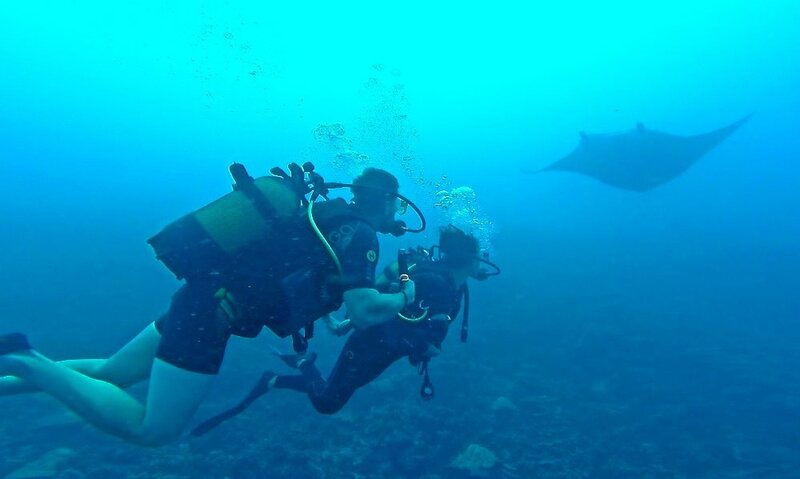 We put the pressure on the dive team that we really wanted to dive with manta rays........and they didn't disappoint! What had been a an otherwise nice reef dive, became perfect when we became immersed in a plankton ball. As we sat there, 2 manta rays circled around us feasting on the plankton and seeming not to care at all about the wide-eyed humans in the middle. It is no exaggeration to say we could've stayed there for hours, unfortunately the restriction of oxygen supply meant we had to bid farewell and return to the surface. I would recommend to anyone traveling to Bora Bora or other tropical islands to consider getting their PADI open water accreditation. You can even do the last couple of dives at accredited places whilst on holiday. Parasailing: Another of the out-sourced activities available is parasailing. This is done from a beach on the main island of Vaitape, so it works in well to pin it on a day you want to spend doing things in the town or one of the other activities on the main island (e.g. helicopter tours) - it just means you will only pay for the shuttle boat once and less time is spent going back and forth. The parasailing was a great experience and a truly unique way to see Bora Bora. The staff were French and didn't speak great English, which was fine, however if you didn't speak French or English as a first language it would've been very difficult to communicate. Game Fishing: Fishing is a huge part of the Polynesian culture. It is also a very popular past-time for visiting tourists. 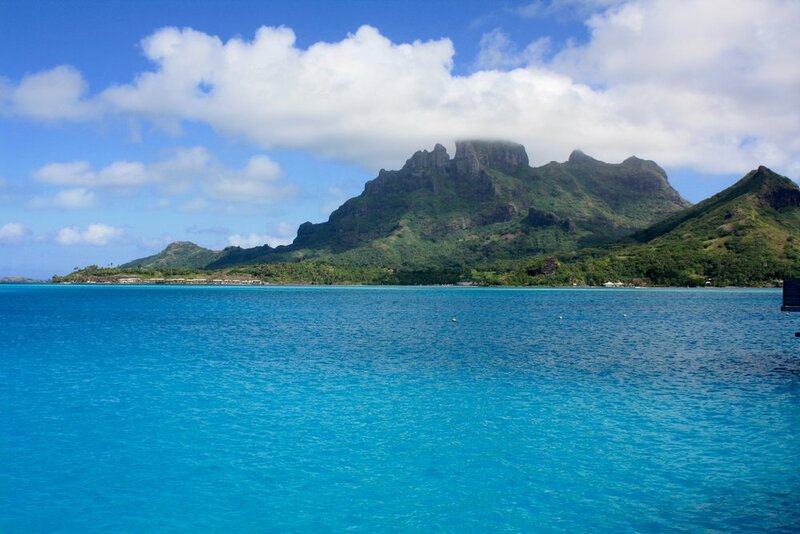 The waters around Bora Bora are home to some of the most sought after game fish - Mahi Mahi, Marlin, Wahu, Tuna. I booked a full day fishing aboard one of the large ocean fishing boats with high hopes of landing a monster from the sea. Unfortunately it wasn't our day! The fishing trip was extremely expensive compared to the other activities and whilst things like catching fish are never a guarantee, I would have hoped that for $1700.00 you might be provided with something to eat during your 8 hours at sea. I found that itself pretty disappointing. The local knowledge of the captain was fascinating and helped pass the time as we cruised waiting for an interest in our lures. I would find it hard to recommend this activity based on my experience and I think not providing any food at all, was totally unacceptable. Snorkel Tour: This is one activity we hadn't booked, but that the concierge recommended. We enjoyed this activity so much we actually did it twice when we realised we had a spare half day at the end of our stay! The tour is a really casual boat trip around the island with extremely entertaining staff. They take you to a spot known for having plenty of sting-rays that can be fed by hand. The staff are careful to ensure only rays that have had their barbs removed are handled and whilst it is a little artificial in that the rays come for the free feed, it is still a great experience with these wild creatures! Next you are taken to visit a "coral garden" - an area full of brightly coloured corals and a huge variety of tropical fish. There are usually a few boats of tourists in the one area and quite a few people in the water, so it pays to just spend your time quietly exploring! Whilst most people are attracted to the larger numbers of more common fish, you can spend time on more selective areas of coral and just hover over them watching the fascinating lives of aquatic life. There is an enormous moray eel that inhabits a known hole at one of the coral garden stops and he is well worth stopping to see. The final stop is outside the calm waters of the reef surrounding Bora Bora - swimming with the sharks. The area has a large population of reef sharks and if you are lucky, a few larger lemon sharks. There is something so fascinating about being in the water with sharks - no matter what size and how many times you tell yourself these are not dangerous! Sharks are one of the most misunderstood animals on the planet and stepping off the boat and going into their world is a humbling experience. I absolutely loved snorkelling around just watching how effortlessly they power through the water and looking into their beady eyes as they stare straight back. For the most part, eating is at the resort as it isn't possible to go anywhere else without taking the shuttle. Four Seasons Resort has numerous restaurants which we found very good. There is a Japanese theme restaurant, The Sunset Bar, on the water that was the best value for money and we felt the best quality also! It is a great place for a few casual drinks at sunset and then some nice sushi. Fare Hoa is a grill restaurant and we had a fantastic seafood platter. There is a fine dining restaurant, which to be honest we didn't try, as we decided to do the private beach dinner instead. The casual dining restaurant, Tere Nui, does breakfast and lunch which are fantastic. The range of the breakfast buffet is the perfect start to the day. 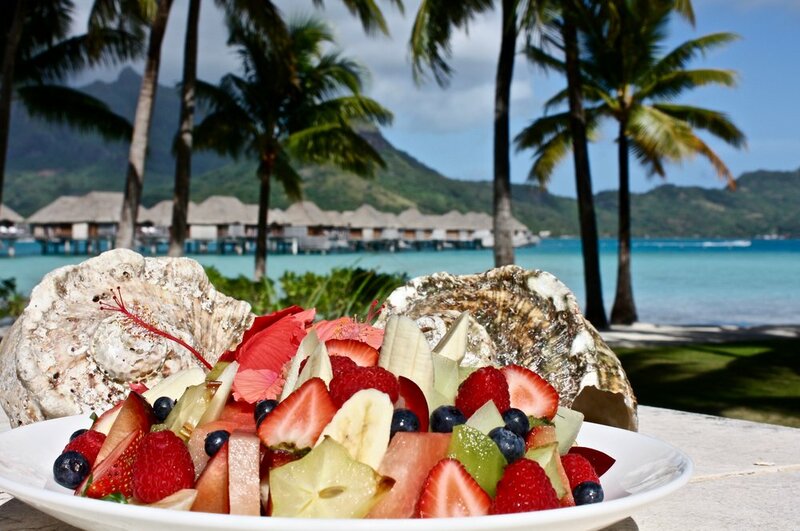 It is a mixture between what you would expect from Tahitian cuisine (fresh fruit, sweet breads) and french cuisine. There is a smaller restaurant that is for adults only for breakfast - we tried this once and to be honest found the atmosphere was lacking, the range not as good and they brought most of the food from the main restaurant anyway. Definitely try as much lots of the fresh island fruit, its incredible. The in room dining menu is actually really good and pretty reasonable. As unexciting as it sounds, we often do a night or 2 of really laid back in room dining if we are staying somewhere for a few days. Sometimes its nice just to stay in, lounge around and have a really relaxed dinner! I couldn't really fault their in room dining menu or service. When you can literally sit on your own private deck and eat a meal as the sun goes down, you almost have to! In Vaitape itself, there are several casual restaurants. We ate at Aloe Cafe after being told that the "popular" Bloody Mary's was quite touristy and only popular because it was on the harbour. Aloe cafe was simple and super casual but the food was nice. Really cheap meal too! In addition to Bloody Mary's, there are several other places on the wharf. The store in Vaitape does sell a range of food. If you are staying in the resorts, there aren't facilities for cooking, so you are really only looking at snacks or necessities. There is a bottle shop in the store, so if you are wanting to buy alcohol, this would be an alternative to buying duty free on the way. 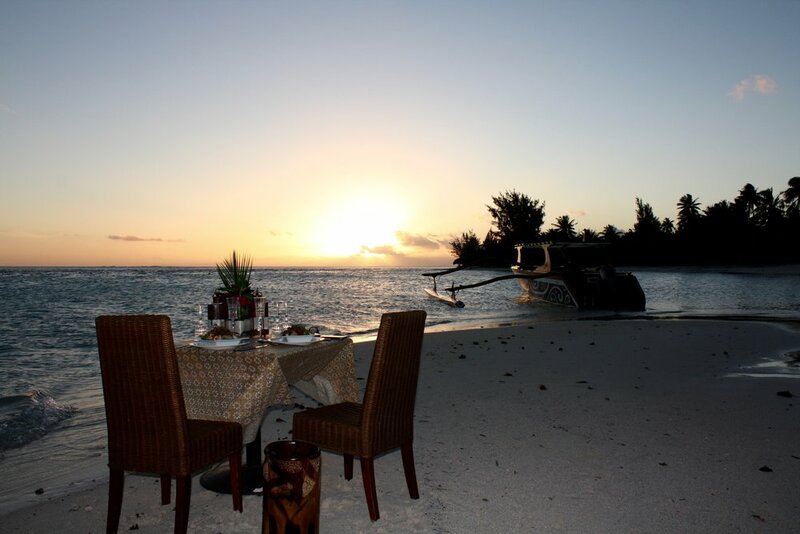 There is an option to book a private beach dinner through the resort - this was without doubt a memory from our honeymoon we will never forget! We were picked up from the dock before sunset by Herre, a Tahitian native with a smile and personality as big as the Pacific Ocean. He had built the wooden outrigger himself and made it into a luxury vessel complete with couches and sunbed. 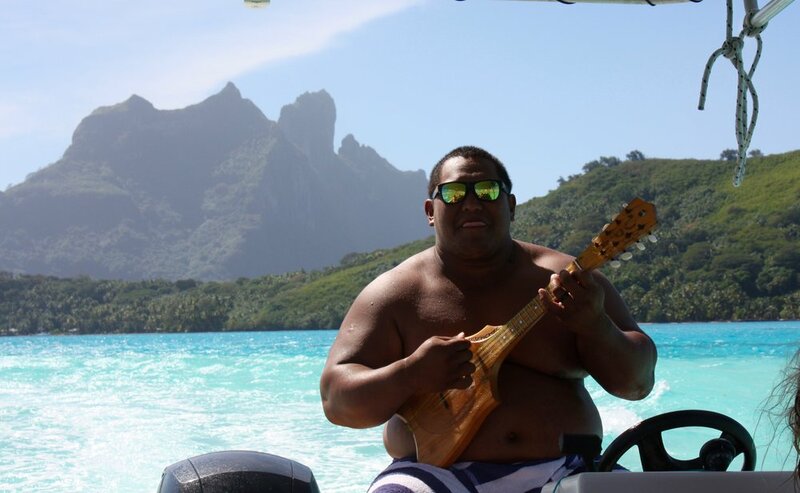 As we travelled to our private beach, our host provided drinks, nibbles and a local serenade complete with ukulele. The beach location was our own little piece of paradise for the evening and he had set up a table literally on the waters edge. We were provided with truly traditional cuisine - recipes he had learned and developed from family. All the ingredients were fresh local produce, from the tuna caught by boats no more than a mile from where we sat to the vanilla in our fruit salad from the nearby island of Raiatea. It was actually so incredible to be treated to great local food, personally prepared by someone so passionate about showcasing his culture to people. Herre played his ukulele while we ate and after the beautiful sunset, he performed a traditional fire-dance routine - a local custom and competitive pass-time. As we sat and enjoyed the evening, he talked us through the constellations of stars that you only get to see when you travel outside populated areas. He explained how his ancestors had used the stars to navigate their way across the vast Pacific as far as Hawaii. As he drove us back across the water to the resort, we both fell asleep on the sunbed at the bow of the outrigger - that content sleep you have on a full belly after an amazing evening! Nearly everywhere you look around Bora Bora is stunning, above and below water level, but something we both found fascinating was the changing "faces" of Mount Otemanu. We would literally get out of bed excitedly each morning to see what our view from the bungalow deck looked like. 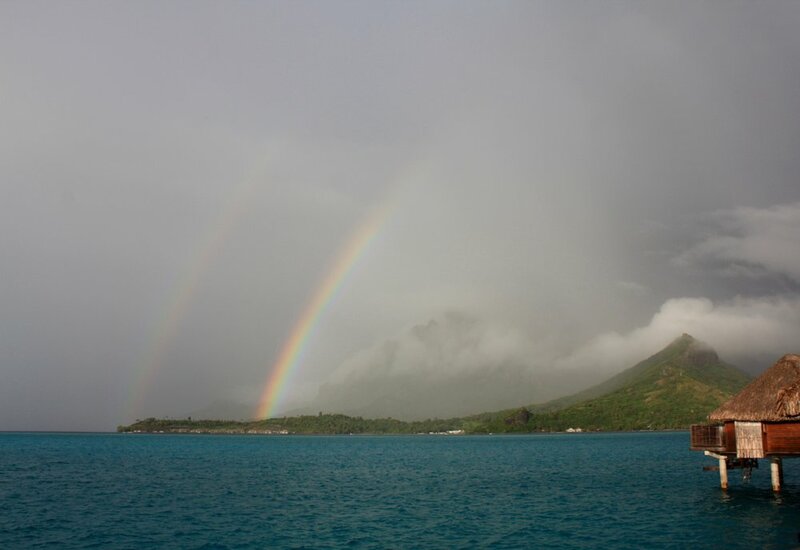 From clear metallic blue skies, clouds clinging to the peak, a spectacular double rainbow, through to one morning when heavy rain made it almost impossible to see the mountain at all. Even throughout the day, the view of the iconic mountain would change from hour to hour. It was hard to walk to and from the bungalow and not want to photograph that view. If you are going to Bora Bora for your honeymoon, it is well worth getting some great photos to "capture the moment". It is without doubt one of the most visually stunning places to visit and the resort put us in touch with a local professional photographer who knew the area well and how to get some great pictures. Like our wedding, these photos will help the memories of our amazing honeymoon last forever. 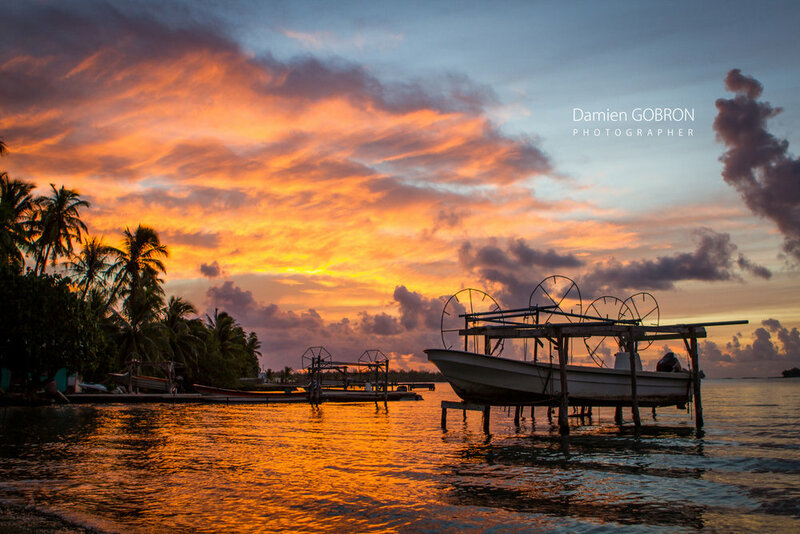 Our photographer was Damien Gobron (Instagram @boraboraphotographer) and he captured some stunning couple shots for us . In the era of "selfies" and smart-phone cameras, there are times when it is well worth getting some truly professional photos.